In this list we will review the best free video editing software which is an easy and convenient way to edit your videos, and is great for beginners. Of course, most free software does not include the same level or quality of support that you would expect to find with software that you purchase commercially. 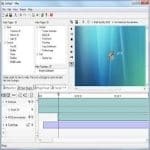 Movie Maker is Window’s free video editing software, which installed on newer computers that are running Windows XP, Movie Maker has drag and drop features to make creating and editing your movie easier. Microsoft has many add-ons for this software, and upgrades are available through the website. This is one of the best free video editing software programs available. iMovie comes free with new Macs, it has many advanced features and add-ons. Unfortunately, the software is only free if you buy a new Mac system. If you want the software without buying the system, it is available for purchase separately. One of the best free video editing programs available for Mac users. VideoSpin, for PCs, is free video editing software from Pinnacle, Video Spin does a pretty darn good job compared with most free video tools. It doesn’t match the qualities of paid softwares but perform basic editing and output movies pretty easily. Also it includes tools, transitions and effects so you can easily jazz up your videos. 2. It can be a plug-in for professional video editing applications. WAX supports hardware graphics acceleration giving you the best out of video cards.